Just two more days to link up your Orange Peel finished quilts, minis, and just-the-tops to the Final Linky Party! All of the 13 entries so far are beautiful and so unique! The linky will close on Monday, Sept. 8 at 11:59 PM. Did you know it's National Sewing Month?! Sew Me a Song is having a fabulous sale - take $10.00 off your purchase of $50 or more. Enter coupon code: SEWSEPT at checkout. The offer is good through September 8th. Maybe you want to stock up on something for your autumn sewing? Please support Becca and check it out! I'm eeking in at the last minute to determine a September goal. I have a bunch of projects due in September and October that I sadly can't share anything about yet (including TWO tutorials! I know!!). So, in order to ensure I get some me-sewing time in, I'll make my voile quilt backing and baste my quilt. I just bought some of the Quilter's Dream Orient Blend Select batting (part bamboo) for this very purpose. According to blog and IG friends, the bamboo batting will make this all-voile quilt drape perfectly. I am *still* deciding how I want to quilt it. Using my walking foot would be perfectly adequate. I've done some hand quilting in the past and I didn't really enjoy it any of those times... but hand quilting would be so great... I don't know. Also, I need to decide on a binding - I think it's going to be a solid cotton fabric rather than a voile to prevent fast wear. Linking up to A Lovely Year of Finishes! You could always machine quilt the majority of it, then go back and hand quilt details - even after you bind it. Best of both worlds? :D Whatever you do, it'll be gorgeous and very snuggly. Oh hurray! That seems like a doable goal for the month, especially around the other things you're doing! 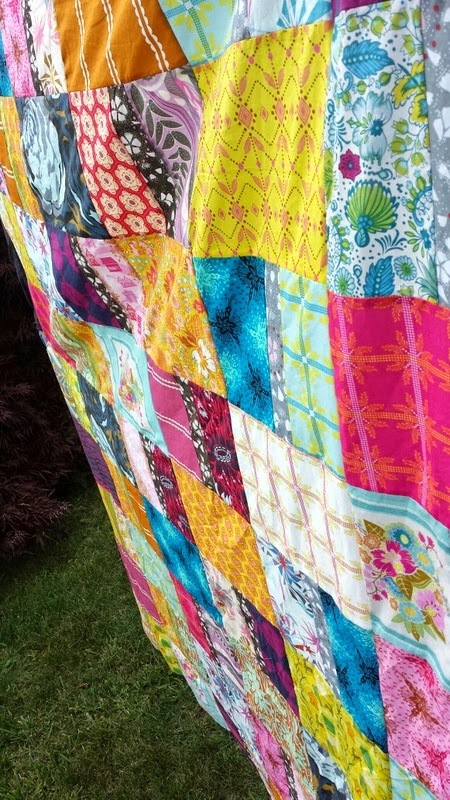 I love bamboo batting from Quilter's Dream - this quilt will have such great drape!! Oh such an obviously special quilt, have you ever considered having it quilted on a longarm...or did I just say a dirty word? It sounds like it will be lovely! Perhaps some simple machine quilting -- stitch in the ditch or whatnot -- to stabilize it and hand quilting is a great winter project while snuggled on the couch.